Freedom and choice or a heavy burden? Closing a school brings a raft of practical headaches as well as a heavy emotional toll, as Peter Crowe found out when he oversaw the federation and eventual closure of a neighbouring school 18 months ago. On the face of it, it was not the most obvious solution to the problem. In April 2008, I was approached by Derbyshire County Council to consider a federation between my school, Tibshelf, and Deincourt Community School, six miles away. Deincourt’s head had recently retired and its future was uncertain; rolls were falling, the school was in special measures and with just 480 pupils it was becoming unviable. The idea was for Deincourt students to be absorbed into Tibshelf between September 2010 and May 2012; the federation would help prepare for this integration and ensure it was handled sensitively. Our involvement was complicated by the proposed construction of a new £20 million school under the Building Schools for the Future (BSF) programme. In 2008 we were in wave 5 of BSF and I believed that the future of our project rested upon our willingness to work with the local authority on the future of Deincourt. I was right; we were moved to wave 3 shortly afterwards and could begin planning for the new school in earnest. In detailed discussions with staff and governors of both schools, there was a lot of uncertainty about what the federation would entail and its impact on standards at Tibshelf. We were determined the process would be done with dignity and with consideration for the feelings of everyone involved in difficult and sensitive set of circumstances. We recruited four additional teachers, strengthening our staff capacity to withstand the loss of a headteacher and the possible loss of other staff due to Deincourt’s impending closure. We embarked on a ‘soft’ federation in September 2008, with two governing bodies. I was contracted, by the LA, to lead the partnership as executive head up to the amalgamation and beyond. It was a bit like an arranged marriage – or a forced one – and there was an expectation that it had to work. With both sets of governors I appointed an associate headteacher at each school, both of whom had day-to-day executive authority for managing and leading. They were primarily responsible for raising standards, engineering good or better pupil progress and the effective and efficient deployment of resources. It created opportunities for staff to shine and show initiative in the way they worked, and was excellent experience for them. In the meantime, I oversaw strategic direction and planning for the amalgamation, as well as convergence of curriculum and staffing, the inevitable redundancy process, generating a vision and planning for the new BSF school. Looking back, some things should have been done differently. The deal with the local authority on creating the federation was more a gentleman’s agreement than a formal contract and it left a lot of grey areas. In hindsight, I would have sat down with the local authority and lawyers to thrash out certain issues, such as how the whole process was to be funded. There was not enough financial support in the lead up to amalgamation, which cost about £300,000 a year – about double what we received from the local authority. Tibshelf already had a £250,000 deficit at the start of the process. In hindsight, a hard federation with one governing body would have worked better but that option would have been time-consuming to create and potentially problematic for the Tibshelf staff. The soft federation, however, led to confusion, duplication and divergence of purpose and I felt highly accountable to too many stakeholders. In other words, I was way out of my comfort zone. The two governing bodies’ agendas were too divergent for me to be able to satisfy everyone. Staffing issues also pose obvious difficulties at such a time. During quiet times when less was happening, staff fed off the rumour mill and there were tensions, fears, and misunderstandings which arose, often quickly and unexpectedly. Apparently trivial problems could become serious if not picked up and dealt with. The hardest group of staff to merge and manage were the two senior leadership teams. When the federation began we felt it was important for the children at Deincourt to retain as many familiar faces as possible, so the redundancy process did not begin until March 2010 when closure and integration were already underway. As all Deincourt staff were interviewed for the available posts, the process was acknowledged by everyone as being fair and transparent and people knew where they stood. We gave out permanent contracts, temporary contracts and redundancy letters, and the redundancies came into effect in August 2010. This process of change went on over 18 months which was a pace people could cope with. I learned quickly that good communication builds trust while poor communication can destroy it. Months of hard work, for example, were undone by the inadvertent and premature circulation of details of proposed structural changes without prior consultation with staff. Gossip and rumour were rife at times and, not surprisingly, there were fears and insecurities both among the staff and in the community. The federation lasted from July 2008 until August 2010. In September 2010, following Deincourt’s closure, the site was reopened as the North Wingfield site of Tibshelf School. As the year 11 group left Deincourt in the summer of 2010 with no year 7s arriving the rolls fell and we began to move pupils over to the Tibshelf site in small groups as and when they were ready. Despite concerns to the contrary most ex-Deincourt students donned their Tibshelf uniforms with pride and have actually looked forward to moving across to the Tibshelf site, even though, in some cases, this involves long multiple bus journeys. On joint themed learning days students have mixed well with the younger ones (year 8) quickest to embrace the change. A key lesson has been the often underestimated ability of students to adapt quickly to completely new circumstances. They frequently put the adults in the learning environment to shame. Many of our convergence activities have been built around Creative Partnerships – inspired, student-led, learning events. They have been new to students from both sites so they come to the situation on a level playing field and often utilise the greater flexibility of space on the North Wingfield site –though this is expensive when ferrying large numbers of students both ways across the six-mile divide. If I have any advice to colleagues going down a similar route it would be to ensure they have a contract in place with the local authority and work through one governing body. Make sure it is signed, sealed and delivered in advance – especially in terms of target outcomes, key leadership role(s) and costed intervention programmes. It is very difficult, even though it may be desirable, to be contracted to two or more institutions. Some federation heads may have cracked this conundrum but I didn’t and it limited my powers and scope for action at critical times. However, it has to be said that the process was, therefore, less threatening to the lead school staff at Tibshelf. Being in a soft rather than a hard federation meant that they were not subject to compulsory redundancy as Deincourt staff were. It gave them some guarantees and helped sustain their morale through anxious times. And what of our BSF deal? After our promotion to wave 3 as a reward for federation, stage 1 planning began in January 2009. A 77-hectare site was purchased by the local authority in the November and thousands of hours were spent by the senior leadership team, governors, LA, BSF team members, architects, construction team and partners in designing our school for the future. In March 2010, we started the stage 2 process – planning the furnishings, landscaping and exterior learning environment. Then, in July, with nearly £2 million already spent, the shattering announcement came: the government was shelving 730 BSF projects nationally, including ours. We never imagined in our darkest nightmares that a project so far advanced would be halted. But it was and it currently still is. Despite the upheaval, our priority throughout was to raise standards at both schools and we wrote and rewrote the curriculum plan several times. Deincourt was taken out of special measures in July 2009 and results improved from 17 per cent five A*-C English and maths in 2008 to 40 per cent in 2010. 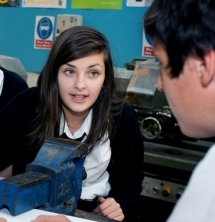 Vocational courses were an integral part of that success and assertive mentoring was used effectively with targeted students to enhance learning and outcomes. Tibshelf also broke all records this year with five A*-C English and maths results up 8 per cent to 61 per cent. Given the circumstances both sets of results were an incredible achievement. Peter Crowe is head of Tibshelf School, Derbyshire.